Berwick described how NHS rations care this way: “you plan the supply; you aim a bit low; historically, you prefer slightly too little of a technology or service to much too much; and thenyou search for care bottlenecks, and try to relieve them.” Relieve them? In 2008 the system Berwick believes is an example for healthcare worldwide denied cutting edge cancer drugs to 4,000 people, forcing thousands to remortgage their homes to pay for treatment. Love is blind. With regard to Dr. Berwick’s devotion to the NHS, it’s deaf and dumb as well. 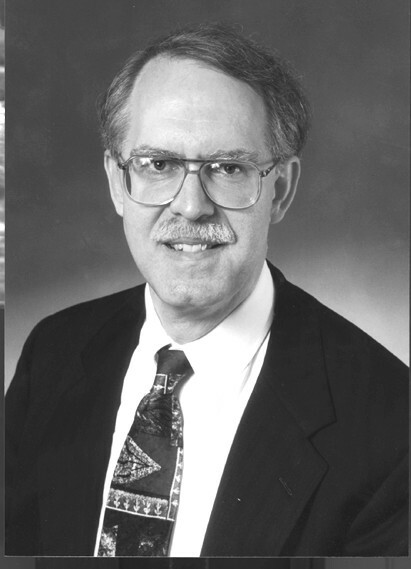 UPDATE: Health Affairs, helpfully, has made Berwick's contributions to the journal freely accessible on its web site, for those who want to learn more. Richard Foster, the Chief Actuary of the Centers for Medicare and Medicaid Services (CMS), released a report on Friday in which he details many of the significant flaws of the Patient Protection and Affordable Care Act. (An actuary is someone who uses statistics, such as death rates and hospitalization costs, as a quantitative way of setting insurance premiums.) Foster estimates that Obamacare will increase federal health expenditures by a net of $251 billion from 2010-2019, even though the President once sold the law as a way to "bend down the cost curve." Most notably, as we and others have argued, the law will drive up the cost of health insurance for ordinary people. Plenty of others have summarized Foster's findings (see Philip Klein and Grace-Marie Turner), so I won't. Read the report for yourself. On Monday, the White House announced that President Obama was nominating Donald Berwick to run the Centers for Medicare and Medicaid Services (CMS), the most important subsidiary of the Department of Health and Human Services. CMS oversees around $800 billion dollars of annual U.S. health-care expenditures, affecting the lives not only of Medicare and Medicaid recipients but of all Americans, since we all use the same hospitals and doctors. If confirmed, Berwick will lay the groundwork for Obamacare’s most fiscally consequential elements: its massive expansion of Medicaid and its elimination of Medicare Advantage subsidies. 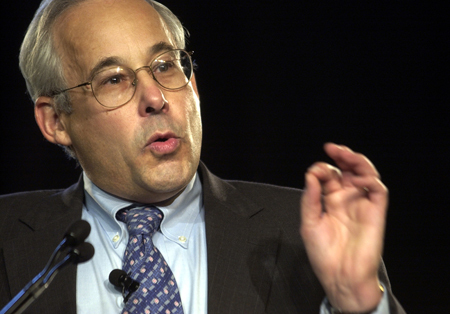 So it’s worth asking: Who is Donald Berwick, and what would a Berwick-run CMS look like? Berwick, a decorated triple-graduate of Harvard with faculty appointments both at Harvard Medical School and the Harvard School of Public Health, embodies the technocratic element of the president’s governing philosophy. As with any decent technocrat, Berwick’s nomination has a good side and a bad side. First, the good. Berwick is a serious and credible health-care analyst. In his capacities both as a Harvard professor and as founder and CEO of a Cambridge-based think-tank called the Institute for Healthcare Improvement, he has written extensively about health-care policy in all of the leading scholarly journals. His focus, in most of these writings, is on the quality and efficiency of health care: things like avoiding medical errors and unnecessary spending. He was granted an honorary knighthood by Queen Elizabeth for his role in shaping Tony Blair’s (mostly futile) attempts to modernize Britain’s National Health Service. While he was a big supporter of Obamacare, Sir Donald acknowledges its core failing; in an October lecture, he said, “Health-care reform without attention to the nature and nurture of health care as a system is doomed. It will at best simply feed the beast, pouring precious resources into the overdevelopment of parts and never attending to the whole — that is, care as our patients, their families, and their communities experience it.” Indeed, if you put Berwick in a room with a leading market-oriented health-care analyst, the two would find broad areas of agreement as to where our health-care system fails patients. If we could ever find the political nerve, we strongly suspect that financing and competitive dynamics such as the following, purveyed by governments and payers, would accelerate interest in [our policy ideal] and progress toward it: (1) global budget caps on total health care spending for designated populations, (2) measurement of and fixed accountability for the health status and health needs of designated populations, (3) improved standardized measures of care and per capita costs across sites and through time that are transparent, (4) changes in payment such that the financial gains from reduction of per capita costs are shared among those who pay for care and those who can and should invest in further improvements, and (5) changes in professional education accreditation to ensure that clinicians are capable of changing and improving their processes of care. With some risk, we note that the simplest way to establish many of these environmental conditions is a single-payer system, hiring integrators with prospective, global budgets to take care of the health needs of a defined population, without permission to exclude any member of the population. Ideologues on the left favor a single-payer system for, well, ideological reasons of material egalitarianism. But for technocrats like Berwick, who shape the liberal policy consensus, the single-payer system is the most efficient way to manage health care. Top-down control, in their minds, ensures that every participant in the system serves the broader public good: hospitals and doctors only perform the tests and procedures they need to; private companies make enough money to get by, without excessive profits; and “integrators” mandate best practices for all parties based on the best available evidence. But the technocratic approach has fatal flaws. First off, as William Schambra observed in National Affairs, it assumes that politicians — and politics — play no role in forming health-care policy. Even if you believe that technocrats could better organize our health-care system, Berwick’s approach only works if the narrow interests of Congressmen, labor unions, general hospitals, the AARP, etc., have no influence on the writing of law. No one who watched Democrats make the Obamacare sausage can harbor any illusions on this score. Secondly, as Friedrich Hayek pointed out back in 1945, the command approach is doomed to fail because its commanders do not gain accurate information about what is happening on the ground. Technocrats may believe they can marshal statistics and analysis to optimize the health-care system, but they are not omniscient. Their analyses rely on too many assumptions and on unreliable data. This is why government programs always result in colossal amounts of waste, fraud, and abuse. On the other hand, a truly free market for health insurance could efficiently allocate health-care resources to those therapies and tests that patients and doctors most need. Conservatives have persuaded a majority of the public that Obamacare is fiscally and morally flawed. But they would be unwise to ignore the technocratic arguments for socialized medicine. Just imagine how Berwick’s confirmation hearing could go: Berwick will make his case for top-down management of the nation’s health-care system; Senate Republicans, unable to challenge him intellectually, will praise his Harvard degrees, ask him easy questions in an angry voice, and move on to the next order of business. And then imagine the same confirmation hearing in an alternate scenario, one in which Senate Republicans go toe-to-toe with one of liberal wonkery’s leading lights. They highlight Berwick’s own critiques of Obamacare; they ask him how his “integrators” are doing in Britain. They ask him what procedures Medicare pays for that he thinks the Independent Payment Advisory Board should eliminate. They take on his advocacy of the technocratic approach, with facts and analysis, and win. By doing so, they meaningfully build the case for repeal. In short, the Berwick nomination is Republicans’ first opportunity in Congress, since the passage of the Affordable Care Act, to show that they have better solutions for the nation’s health-care problems. Will they seize it? When Obamacare passed on March 20, much was written about how, on that day, America abandoned its classical liberal pretensions and finally assimilated into the social-democratic consensus of Europe. At long last, we Americans would let the state take responsibility for funding our health-care system. 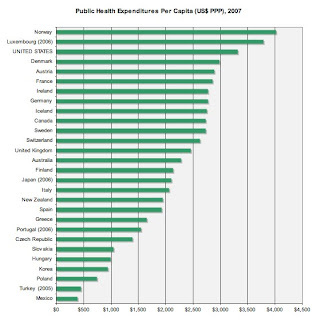 The good-old, freedom-loving U.S. of A. took bronze in the State Health Spending Olympics despite the fact that the percentage of overall health spending undertaken by our government was second-lowest in the OECD, at 45.4 percent. In other words, we spent more on government care for the elderly and the poor than most normal governments spend on health care for everyone. Why is this so? It is, as I discussed in the latest issue of National Affairs, because our health-care system is neither socialized nor free, but the worst of both. The government does not yet control enough of the overall system to ration health care as the Left would desire, and does nothing about widespread fraud and abuse under its auspices. By instead underpaying doctors and hospitals for their services, it drives up health-care costs for the private sector. And most employees in the private sector don’t pay directly for their own care, leading them to expect lavish treatment at the expense of others. In a truly free-market system, individuals would be responsible for their own health-spending choices, reducing costs and improving quality. The Patient Protection and Affordable Care Act, of course, does not solve these problems, but augments them. 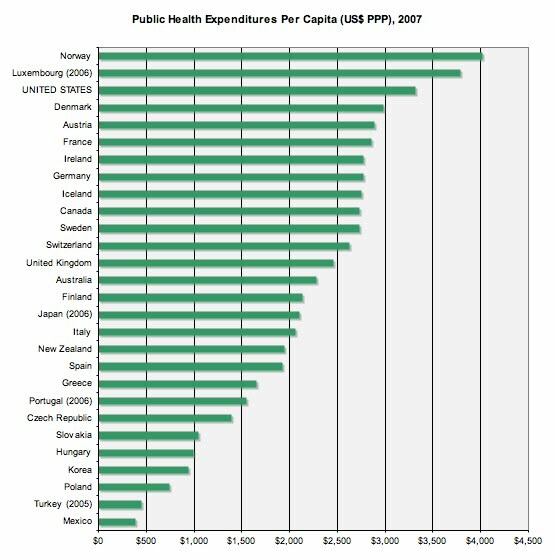 By 2019, depending on how far up Obamacare drives health inflation, it could add another $500-$700 of per capita state health-care spending to our totals, bringing us within reach of first-place Norway. Most advocates of “repeal and replace” emphasize the political need to show Americans that Republicans are not merely the “Party of No.” But, even if repeal succeeds, there is a compelling public need to reform the U.S. health-care system before it falls apart. That Obamacare worsens our existing system only adds to the urgency. Fannie Mae and Freddie Mac caused the Great Recession by socializing risk and privatizing reward. Similarly, our partially socialized health-care system cannot survive indefinitely. It is a ticking time bomb that, if not defused, will either lead to a collapse of the private insurance market, or the U.S. fiscal situation, or both. It was a problem well before Obamacare became law, and it will need to be tackled even if Obamacare is repealed. When Republicans talk about “repeal and replace,” what should go in the “replace” category? One essential element must be to increase the penetration of consumer-driven health care. CDHC, as regular readers of this blog are well aware, consists of health plans in which consumers buy insurance for catastrophic health events, but pay routine expenses directly using tax-free health savings accounts. While Obamacare will do much to increase the cost of health insurance, consumer-driven plans can make health care more affordable, without raising taxes or increasing government spending. Companies that fully converted their employees from traditional plans to Aetna HealthFund plans reduced their medical costs by over 10 percent relative to their PPO counterparts, saving $1,812 per member over a five-year period. HealthFund members spent 10 to 15 percent more than their traditional counterparts on preventive care. HealthFund members used the emergency room 5 to 10 percent less than PPO members did. HealthFund members used cheaper, generic drugs at a higher rate than members of traditional plans did. HealthFund members were twice as likely to use online consumer tools to search for information on health-care costs. Naturally, the Patient Protection and Affordable Care Act puts consumer-driven health plans at the mercy of the Secretary of Health and Human Services, where they are at risk of being curtailed, if not asphyxiated. Republicans are most likely to gain the chance to repeal Obamacare if they can show that their own ideas will make health care more affordable. There are few better places to start than with consumer-driven health insurance. If you wonder what will happen to health insurers under Obamacare, all you have to do is look at Massachusetts. Despite the fact that 97 percent of Massachusetts residents have health insurance, the cost of that insurance is the highest in the nation. A 2009 study from the Commonwealth Fund found that the average employer-sponsored family plan cost $13,788 in Massachusetts in 2008, 12 percent above the national average. But did near-universal coverage reduce the cost of health insurance over time? No. In fact, the cost of family health insurance increased 40 percent in Massachusetts from 2003 to 2008, 21 percent faster than the rate of growth nationally. Is it conceivable that politics played a role in Murphy’s ruling? The announcement had political overtones: Gov. Deval Patrick, a Democrat, is seeking re-election this fall against a field that includes Republican Charles Baker, the former president of Harvard Pilgrim Health Care. “The governor’s actions today represent an election-year gimmick which fails to address the underlying causes of increased health care costs,” said Baker spokesman Rick Gorka. Patrick aides sought to bring attention to the governor’s announcement by inviting reporters to his appearance at the Chelsea Clock Co. It occurred moments after the Division of Insurance released its statement. The theatrics harkened back to testimony Patrick gave last month before a legislative committee reviewing the provider cost-increase cap. Aides also assembled reporters for that event, and Patrick emerged to accuse Baker and Treasurer Timothy Cahill, waging an independent run for governor, of inaction on the issue. The insurance division rejected the rate filings through an emergency regulation announced by Governor Patrick in February. The Patient Protection and Affordable Care Act is somewhat vague in how it treats consumer-driven plans. It reduces the amount that people can save in certain types of tax-free health savings accounts (HSAs). It restricts policyholders’ ability to buy over-the-counter medications using HSAs. It appears to leave the Secretary of Health and Human Services in charge of whether or not HSAs qualify for the state-based insurance exchanges that the new law creates. [We must] plan for the termination of our Healthy Indiana Plan. This is the program that’s currently providing health insurance to 50,000 low-income Hoosiers. With its health savings account–style personal accounts, it has been enormously popular among its participants. I hope those folks will do all right when they are pitched into [traditional] Medicaid. Governor Daniels, arguably the country’s most innovative health-care reformer, was granted a Medicaid waiver by the Bush administration to try a consumer-driven approach. Daniels’s plan rerouted existing Medicare disproportionate-share hospital payments into health care for the poor. While those under 122 percent of the Federal Poverty Level (currently $22,050 for a four-person family) remained on traditional Medicaid, everyone else, up to 200 percent of the FPL, was eligible for the Healthy Indiana Plan. The plan has been exceptionally popular, and harbors a sizable waiting list for entry. By contrast, Obamacare bluntly forces states to expand Medicaid from 100 percent of the FPL to just 133 percent, but for a fully implemented cost exceeding $100 billion per year. Governor Daniels was able to bring health care to more people, at a far lower cost per capita, than Obamacare will — but he may no longer have that option. If Governor Daniels’s interpretation of Obamacare is correct, the law will reduce health-care options for Indiana’s poor, will place long-term strain upon Indiana’s budget, and will force the state to drastically curtail its coverage of those above 133 percent of the FPL. What were those “top ten benefits” of Obamacare again?